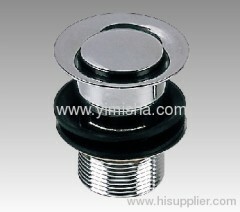 Ningbo Yimisha Sanitaryware And Valve Co.,Ltd. Function: use for basin, tub, sink and public waste drain area. 4) Function: use for basin, tub, sink and public waste drain area. 1.Our company can offer the non-standard Valves,according to customers requirements. 2.Our monthly production capacity is about 100000 pieces. 3.We have 100 staff members, including 2 senior engineers and 4 experts. 5.Our aim : honesty, professional service, quality products, punctual delivery.